Nakajima Racing’s Bertrand Baguette and Kosuke Matsuura are the surprise winners of the Suzuka 1000 race at Suzuka Circuit, the sixth round of the Japanese Super GT Series. For the crew in the #64 Epson Modulo Honda NSX it’s the first win of the season. Baguette and Matsuura were 17th in the championship standings before this race, with 8th place at Sportsland Sugo as their best result. For Baguette, it’s the maiden Super GT victory in his fourth season with Nakajima Racing, Previously, he scored only one podium in 2014. For Matsuura, who joined Nakajima Racing this year after six season with ARTA, it’s the second win in a career. A duo in the #64 Honda scored second win of the season for Honda, beating Tsugio Matsuda and Ronnie Quintarelli in the #23 Motul Autech Nissan GT-R. One more Honda crew, Naoki Yamamoto and Takuya Izawa in the #100 Raybrig Honda, reached a podium. Fifteen GT500 crews took part in the race. 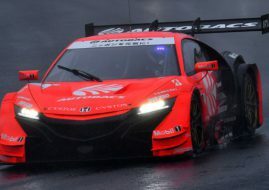 Formula One star Jenson Button made his Super GT debut in the #16 Honda NSX, he was sharing with Daisuke Nakajima and Hideki Mutoh. After having lots of problems during a race (penalties and punctures) they finished in 12th place. In the GT300 class, Haruki Kurosawa and Naoya Gamou are the winners in the #65 Mercedes-AMG GT3 of Leon Racing. They won the race ahead of two Lamborghinis. The #88 Huracan GT3 finished second, driven by Manabu Orido, Kazuki Hiramine and Koji Yamanishi. The #87 Lambo takes third place, driven by Shinya Hosokawa, Kimiya Sato and Yuya Motojima. 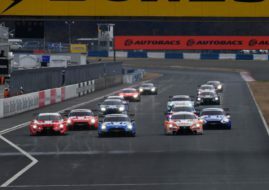 Today’s race was the last time that Suzuka 1000km was included as a round of Super GT, as the current 1000 km format would be dropped in favour of a 10-hour race for 2018. 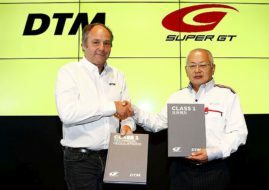 The new race will be aimed primarily at FIA GT3 and GT300 machinery.